Release Date: March 10th, 2006 by Walt Disney Pictures. The Cast: Tim Allen, Kristin Davis, Zena Grey, Spencer Breslin, Danny Glover, Philip Baker Hall, Robert Downey Jr., Jane Curtin. BASIC PREMISE: Dave (Allen), a district attorney and father of two children, turns into a sheepdog in this remake of the 1959 film. 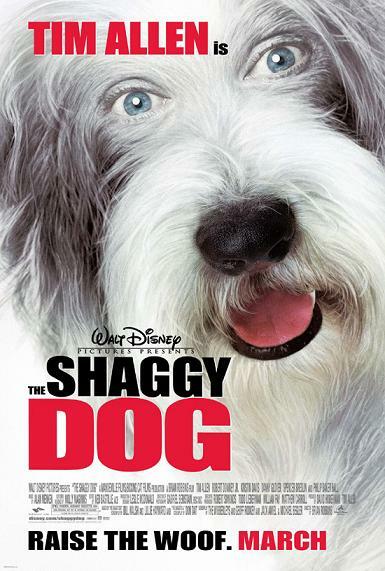 ENTERTAINMENT VALUE: Unless you’re a big fan of Tim Allen, The Shaggy Dog has very little in it that’s fresh or funny. Little kids will be mildly entertained by the physical humor, like when Dave behaves like a dog during a trial and during a parent-teacher conference. The rest of the humor feels just as juvenile, repetitive and simply too forced. Kirstin Davis plays his wife Rebecca, but they barely feel like a real husband and wife. Everything else in the silly plot comes across as contrived and boring—i.e., Dave’s teenage daughter and son are only there as plot device to show how Dave further neglects his family. Robert Downey Jr. gives a creepy performance as a mad scientist, but he’s too over-the-top to be funny. Jane Curtin, Danny Glover and Philip Baker Hall make appearances so brief, they seem more like cameos. On a positive note, the sheepdog looks very adorable and has a few barely-funny scenes. A bunch of cross-bred animals give some brief comic relief, i.e. a snake with a furry tail and barking mice, but you’ll have to wait until the messy third-act for them. INSULT TO YOUR INTELLIGENCE: Contrived, awkward and unfunny. IN A NUTSHELL: Once again, Tim Allen proves that he can’t be convincingly funny or serious on the big screen. This mostly unfunny and juvenile remake will make you wish you would have rented the original instead.